In Italy coffee is an age-old ritual, from the first sip in the morning at home, to various coffee breaks in bars and coffee-shops later on in the day. In Naples, people are so addicted to coffee that songwriters often dedicate folk arias to their beloved drink. Even in English-speaking countries, many coffee names are Italian: cappuccino, espresso, caffè macchiato, caffè latte, lungo, ristretto, corretto, americano, and yet… coffee is obviously not an Italian product. The Coffea arabica is native to Ethiopia, where the Muslims used the beans’ energetic potential to stay awake during their long prayer vigils. For this reason, 1,100 years ago, some coffee seeds were brought into “Arabia Felix” (modern-day Yemen), and Muslim dervishes began cultivating the shrub in their gardens. Then Arabian traders sailed from the port of Mokha to Mecca and Medina, where, at the end of the 15th century, coffee tasting sites were created inside the Sufi’s shrines. Soon a business was born. From Ethiopia and Sudan coffee was brought to Madagascar, the Comoros, Mauritius, Persia and Réunion in the Indian Ocean. By the 16th century, Turkey, North Africa and Malta reached a trade agreement with the Republic of Venice to access what at the time was the main European port. There, at the beginning of the 17th century, coffee was introduced among the aristocracy and later, in the mainland, to students, teachers and visitors at the University of Padua. In Rome, Pope Clement VIII (1592-1605) was advised to ban coffee consumption. It was seen by clerics as a satanic threat coming from the “infidels”, but the Holy Father, once he tasted it, blessed the new drink stating the real mortal sin would have been leaving it to the infidels! The first European café was inaugurated in Venice, in 1645, followed by others in 1683. By the end of the 17th century, thanks to the British East India Company and the Dutch East India Company, coffee became available in North Europe too. The first English café was inaugurated in Oxford in 1651, and the second in London the following year. Three more historic coffee houses opened in those years and are still operating today: Queen’s Lane Coffee House, founded in 1654; Café Procope in Paris, operating since 1686, Caffè Florian in Piazza San Marco, founded in 1720. Coffee houses soon became favorite locations for philosophers, scholars and professors to meet and socialize. The first ideals of liberalism started there, through fierce religious and political debates. The famous Lloyd’s of London insurance company was born at the Lloyd’s Coffee House. The London Stock Exchange in its modern version was also opened in the famous Jonathan’s Coffee House, where the first stock exchange list was published. After the battle of Vienna, in 1683, a sergeant acquired the coffee beans left over after the Turks defeat, and found his fortune creating the “Melange Viennese” recipe: mild coffee with added sugar and milk. In 1727, John V of Portugal acquired some coffee seeds from French Guyana with the aim to grow coffee in Brazil. Market volatility and increasing returns encouraged Brazilian entrepreneurs to start a large scale production around 1830. Between 1860 and 1885, they built vital infrastructures, and approximately 7,000 km of railroads to enable the arrival of labourers that were needed in the plantations. The coffee production increased. In 1880, São Paulo produced 1.2 million bags (25% of the world production), in 1888 2.6 million (40%), in 1902 8 million bags (60%). Coffee reached 63% of the country’s exports. In the early 1900s the coffee operations attracted 733,000 immigrants, mainly from Portugal, Italy, Spain, Germany, and Japan. Coffee tasting pleasure got a boost in 1884 when Angelo Moriondo from Turin invented the espresso, which is brewed by forcing a small amount of nearly boiling water under pressure. Seventeen years later the Milanese Luigi Bezzera came up with several improvements, and in 1905, his patent was bought by Desiderio Pavoni, who founded La Pavoni company. In its small workshop, located in Via Parini in Milan, the espresso machine would be produced industrially (one a day). After this long history, something great is happening again in Milan. Even though the Milanese lead a frenetic lifestyle and are not so keen to sit around or linger in coffee shops, a big event has recently changed the city’s coffee scene big time: the first Starbucks location in Italy – and one of the most beautiful in the world. At the time of writing, a long queue of people waits patiently in line everyday to get a glimpse of the new Starbucks Reserve Roastery, which was inaugurated on September 7th at the site of Milan’s former Palazzo delle Poste (Post Office building) in Piazza Cordusio. Starbuck’s story is pretty long too. Since 1971, Starbucks Coffee Company has been committed to ethically sourcing and roasting high-quality arabica coffee. Growing in partnership with strategic licensees to more than 3,100 stores in 40 countries across Europe, the Middle East and Africa, they opened their first store in Europe 20 years ago in London. Today, with more than 25,000 stores around the globe, Starbucks is the premier roaster and retailer of specialty coffee in the world. Nowadays the Milan Reserve Roastery reinforces the company’s investment in its premium brand as part of its overall growth strategy around the world. And later on this year they will bring additional cafes to Milan. As a sign of their great respect for Italy, they have followed Italian culture in terms of traditions, art, design and craftsmanship. Presently they are working together with Italian licensed partner such as Percassi www.percassi.com; Scolari Engineering S.p.A www.scolarieng.net; and the baker Rocco Princi www.princi.com/rocco-princi. 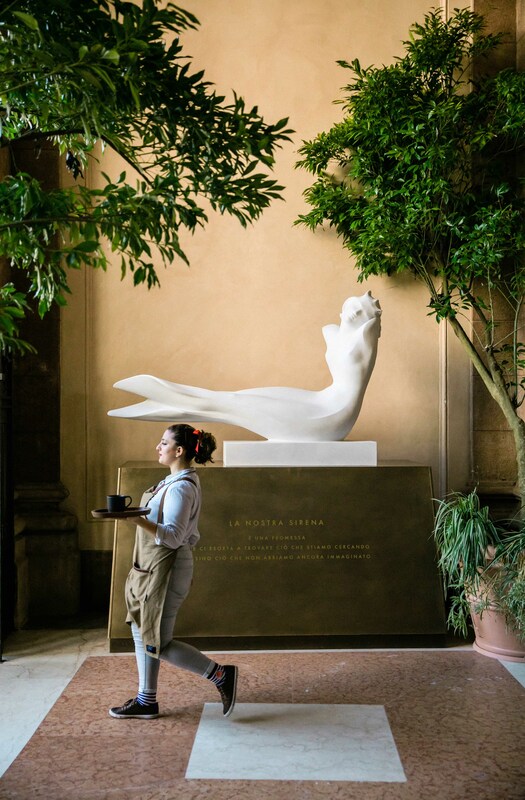 On show in the portico is the Starbucks logo: a classical statue of a siren hand-carved in Carrara marble by Tuscan sculptor Giovanni Balderi. Indoors, a crew of masons and artisans built a wood-fired oven onsite, brick by brick; on the floor a palladiana was chiseled by hand by Italian craftsman Solari; while the centerpiece is a floor-to-ceiling, wall-to-wall visual representation of Starbucks history engraved in brass by local craftsmen. Nearly 300 employees (baristas, coffee roasters and bakers) have been hired. Moreover the Starbucks Foundation, partnering with the Fondazione Don Gino Rigoldi, is also creating educational and career opportunities to fight youth marginalization in disadvantaged areas of Milan. The Foundation is also supporting programmes in partnership with La Scala Academy, focused on scholarships, job training and community engagement that offer students greater access to education and employment. To know more see news.starbucks.com and Starbucks.com.